If you ask me, I’d tell you her superpower is thoughtful and thorough communication — something that I, as a communications professional, deeply admire. 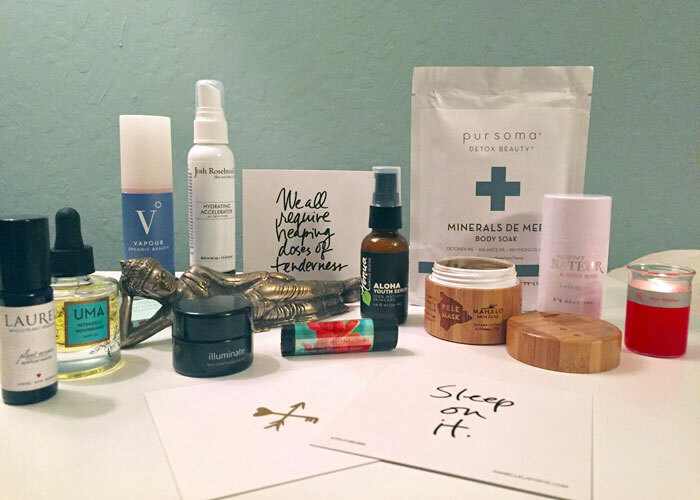 The spa director-turned-beauty entrepreneur is the brains behind Beauty Heroes, a slow beauty subscription box that introduces its members to one full-sized “hero” product per box plus a smaller “sidekick” product from the same line. With her beauty startup, Jeannie has demonstrated smart customer service via social media, email and more, and has put up with many of my long-winded emails asking for the specifics of how her subscription box service works. This, combined with Beauty Heroes’ quality-over-quantity approach to product sampling, makes it stand out among deluxe samples size boxes on the market. Jeannie’s approach to product discovery encourages a more intentional experience, and allows for the inclusion of more luxury, sought-after brands not typically included in sampling services (think Vintner’s Daughter, In Fiore, MUN and more). Today, I’m sharing her current health and beauty favorites — a list of thoughtful products that keep her looking and feeling beautiful on both the inside and out. This Hero product changed the way I view hair oils. A little goes a long way, it really works and it’s not greasy. It’s a miracle worker in my book, and the scent is gorgeous! I like light hydration for the day time, and this serum has a really beautiful ingredient deck of organic botanicals that soak in immediately and don’t leave my skin oily, so I can move quickly in the mornings. I have been testing this lip balm for a blog post I am writing about flower essences for Katie Hess’ new book, Flowerevolution. I reapply it all day, especially before long conference calls so I am encouraged to speak my truth all day long. There is only one candle for me, and that’s red flower. Their candles, made of vegetable wax, have lit my home for the past 13 years. They are unique and special and make me happy. And I thought I liked the original. This special edition version of Agent Nateur with Shiva Rose is it! It goes on so smooth, never irritates and keeps me smelling like roses all day. These cards carry magic for me. Sometimes I just need some words of encouragement, enlightenment and wisdom. They’ve never failed me. I can feel the quality of the ingredients in the Pursoma Bath Formulas. They are so therapeutic, and take me back to the days when I used to give hydrotherapy treatments in the spa. I love drawing baths — for myself and for others. It’s the quintessential face, hair and body mist. I just don’t think it gets any better than this. A beautiful collection of ingredients that soften and hydrate the skin and smell fresh and clean. It should be sold by the gallon! This makeup primer has changed my beauty routine forever. I simply won’t go out anymore without it, whether I am wearing makeup or not. The difference it makes on the skin is subtle, but visibly perceptible, as it evens out the discoloration of my skin, smooths lines and leaves my skin with a natural but finished look. This mask does so many things for my skin, I always go back to it. I mix it with a drizzle of warm water and honey and can leave it on for an hour. I just can’t believe how good my skin looks after the Pele. It has so much in it, it’s just a powerhouse of good skin food!